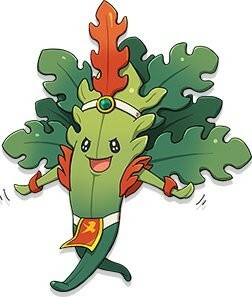 Wakame Star resembles his pre-evolved form, however, he now wear a red loincloth and red leaves cover the holes of a sleeveless shirt. In addition, he now has a headband with a red piece of seaweed sticking out like a feather. Several pieces of green seaweed stick out from his back like feathers as well. A red and gold token is worn upon his back. There is no backside to his loincloth, exposing his fine, supple legs.